Cala Bella has a strategical location within the island. This secluded place is reachable taking a transitable dirt road of 1,3 km., hidden in the mediterranean maquis from Marina di Campo. Many local attractions are reachable in a few minutes driving. The mondan village of Marina di Campo is at 4 km., the nice Procchio is at 6 Km. They both have shops restaurants, disco etc.. The island is narrow just 5 km from Procchio to Marina di Campo so easy to across from here. Elba will inspire you with a feeling, that will force you to come back again: the feeling of being at home. Magic because so typical and capable, with its many details, of inspiring you with emotion of freedom and free contact with nature. 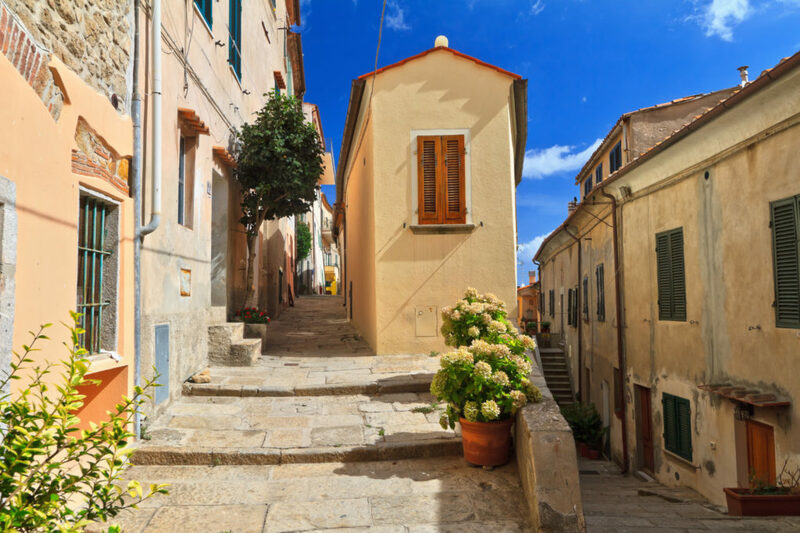 Elba, not too big and not too small, capable of exploiting means of civilazation but avoiding of compromising the magic and charm of its nature, landscape, sea, mountains and forests as well as the reminds of typical historical small villages. Small Villages on the sea or up on a hill, full of legends and history, last reminds of different civilization trhough the centuries. Forests, sources of pure water, country landscape, coasts with exotic plants. And for the evening typical restaurants on the beach waits for you as well as a romantic breath taking sunset..
Elba is well connected with the tuscany coast in Piombino. A ferry takes 50 minutes to reach Portoferraio . Timetable depends on the season. In high season, almost every hour. Piombino is about 2 hours from Florence ( motorway connections), a daily excursion in the city or in the tuscany coast and inland is also possible. Elba is reachable by plane flying directly to Marina di Campo . Flying to Pisa and then taking a train to Piombino is also possible. Rental of a car on the island can be arranged on request. Elba is only 10 km. far away from the Tuscany coast but it ‘s so different from this flat area! The island is like a mountain on the sea and for this reason it developes a variety of coasts ( 147 km.) and landscapes, a mild climate, beautiful bays. Elba is the biggest island of the Tuscan Arcipelago and the third italian biggest island. It’s a world wide famous touristic centre.